HP decided to use a Troyan horse tactic to strengthen it's brand. 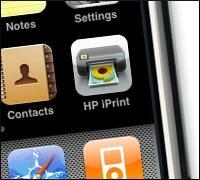 iPrint Photo adds a printing solution to the iPhone and iPod touch. With this free app the users can print 4x6 photos to any HP printer on the network, yes it prints through network.